Into the Woods › Amazon buys Whole Foods?? This morning we learned that Amazon has bought Whole Foods for $13.7 billion in cash. What’s up? Information on Amazon’s plans for Whole Foods is in short supply at present, except that it’s known that Amazon wants to get into the grocery business, that Amazon was interested in a brick-and-mortar presence, and that Whole Foods was hurting, chiefly because of cheaper competition. I feel a very strong interest in this, because it happens that Whole Foods and Amazon are the two organizations that get most of the money I spend. Until we learn more, I’m forced to speculate about what’s going to change. First of all, Whole Foods was starting to show (at least in the Winston-Salem store where I shop) alarming signs of money problems. Staff seemed increasingly spread thin. The coffee bins and bulk bins were sometimes empty and neglected, with no bags. The produce wasn’t as fresh and beautiful as it used to be. Basic perishables such as cream would be out of stock. The decline troubled me so much that I shopped one week at a competitor, Fresh Market, to investigate whether I should switch stores. I decided to stick with Whole Foods and hope for the best. One of the sad things about Whole Foods is that much of the new competition has been coming from grossly inferior stores — Publix, Aldi, and a new one, Lidl. Aldi, as far as I could tell having only been in one once without buying anything, is what grocery stores would be like in hell. You had to deposit a quarter to get a grocery cart! The produce looked more like compost prewrapped in plastic. How such dreadful stores could give Whole Foods a hard time puzzles me, but apparently that was the case. So then, Amazon could have seen its grocery future in an Aldi-like store, or even a Publix-like store, stores with a mass-market and warehouse feel to them. Certainly that’s what Amazon Pantry implied. Amazon Pantry sells only mass-market stuff that I would never buy. But instead Amazon chose Whole Foods, with its high-end, high-priced reputation, a chain that everybody knew was starting to get into trouble and that needs some repair to its reputation. Surely this tells us something about Amazon’s intentions for Whole Foods. Until I find out otherwise, I’m going to take the optimistic view: That Amazon will spend heavily to spiff up Whole Foods stores that were starting to show signs of hardship, and that Amazon is aiming at the high end and leaving the low end to a now crowded low-end market. Also, there is bound to be some kind of integration between online grocery shopping and going to the local Whole Foods. This could be great! For a while, it looked as though bottom-feeder stores like Aldi were going to make life harder for high-end shoppers like me by driving high-end stores like Whole Foods into poverty. Now suddenly the prospects have turned. With Amazon aligned with Whole Foods, we may soon see the bottom-feeder stores starting to look shabby. This was written by daltoni. Posted on Friday, June 16, 2017, at 10:41 am. Filed under Food, Sustainable living. Bookmark the permalink. Follow comments here with the RSS feed. Trackbacks are closed, but you can post a comment. Very quick with the post on this, nice. Curbside pickup is the new thing with Walmart and Kroger. Empty stores with employees loading carts, hauling them to cars, and restocking shelves with all the purchases done through apps is the way of the future, sadly. I tend to buy impulse items almost as much as ones on a list. Amazon’s play is confusing right now, that’s for sure. I see it as a show of strength against Walmart more than a play into the grocery game. 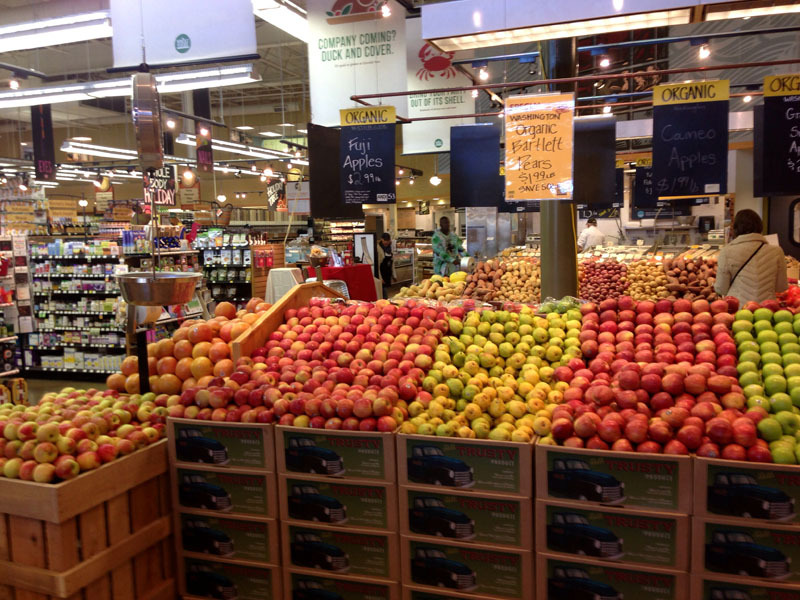 Whole Foods could end up a hodge podge of random items for all we know. I doubt it, though. If I were to bet, this is a ground game play to increase the market share of curbside pickup. If that’s the case, and since Walmart is their main competitor online, then Walmart may have to get creative with their shipping methods, maybe merging with FedEx. Dan: Yes. Competition with Walmart wasn’t really on my radar screen, because Walmarts don’t have much stuff I need other than cat litter and bleach and canned red salmon. I could almost see the market splitting along class lines, with older tech-hostile people and poorer people getting their groceries at Walmarts and Dollar General, and with Amazon aimed more toward higher-income people who are comfortable with technology. I’ll never forget the late ’90s boom years in San Francisco when you could order groceries online from WebVan and have it delivered to your home the next day. I used the heck out of WebVan. Normally I like to paw over produce, but WebVan had such high standards (as required by the Bay Area market) that their fresh produce was great, even though you didn’t get to pick it out yourself. I think that particularly as an older person who loves staying home, I’m glad to see this. Amazon Prime has saved me lots of shopping time and miles driven. I just hope that whatever Amazon comes up with gets out to the rural fringes. I own some $WMT so I figured that before I saw this article. If I was a market savant, I’d have owned $WFM. I think Walmart is savvy enough to stay bigger than Amazon for the long-term, but way down the road there may be a change in the retail hegemon. Some serious changes in government and networking infrastructure will have to happen first. If a retailer tries to split their market share along class lines, I’d bet on the have-nots winning that contest, strength in numbers. Dollar General is an oddity as well. If I drive out beyond where I live, which is near an urban metro but about 4 or 5 miles as the crow flies away (15 minutes driving), you start seeing a DG about every 10 to 20 miles. They’ll be nothing else in a given direction except maybe a rural church or a mechanic, but almost certainly they’ll be a DG close to an intersection. Maybe they have enough revenue from urban stores to maintain capital for low-traffic ones in rural areas. My wife uses Amazon enough to get our money’s worth out of Prime, but I still tend to get what I need on impulse which usually means I have to get it while I’m out and about since it’s such a drive to get back to the city. I tend to use Amazon like a catalog of ideas, then buy at a store where I can ask my dumb questions. I have always thought of Aldi’s having the inspiration to require a $.25 deposit to use a cart a stroke of genius. There are never any loose carts on an Aldi parking lot. You might not have spent enough time there to realize that the quarter comes back to you when you return the cart to the cart stall. That’s one idea that I wish other groceries would adopt. No loose carts to run into and no time spent by employees to pick them up.